According to Statistics Finland’s preliminary data, prices of dwellings in old blocks of flats and terraced houses went down by 1.1 per cent in the whole country from July to August. In Greater Helsinki prices remained unchanged and in the rest of the country they fell by 2.2 per cent. Compared with the corresponding period of the previous year, prices remained almost unchanged in the whole country. 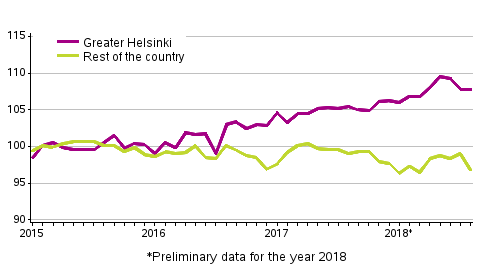 In Greater Helsinki, prices went up by 2.2 per cent, while in the rest of Finland they went down by 2.3 per cent from the year before. In August 2018, the average price per square metre of an old dwelling in a housing company was EUR 2,090 in the whole country, EUR 3,615 in Greater Helsinki and EUR 1,632 elsewhere in the country. According to data available to Statistics Finland, 37,730 transactions of old dwellings in housing companies were made in the whole country in January to August. The number of transactions was 10,985 in Greater Helsinki and 26,466 in the rest of Finland. In the corresponding period of last year, 37,983 transactions were recorded in the whole country. In Greater Helsinki, the number of transactions was 10,979 and in the rest of Finland 27,004. ISSN=2323-8801. August 2018. Helsinki: Statistics Finland [referred: 24.4.2019].